Meteorites killed the dinosaurs and have nearly wiped out humanity in multiple Hollywood blockbusters, but have these deadly space rocks actually gotten a bad rap? One geologist argues we should actually be thankful for all meteorites have done for us. Ted Nield, the author of the new book Incoming! : or, Why We Should Stop Worrying and Learn to Love the Meteorite, explains in an interview with the British newspaper The Guardian why meteorites have been benefited Earth throughout its long history. He points out that, while meteorites can cause an extinction event every few hundred million years, the odds of being killed by a meteorite are beyond remote - in all of human history, the only claimed meteorite fatality was a dog in Egypt in 1911, and he says that was almost certainly just a story. And, on any sort of timescale we should be worried about, Earth's chances of being hit by a meteorite are next to zero. Well, they have had an influence on life on Earth. Consider the great Ordovician biodiversity event, which took place around 470m years ago, when there was a big increase in numbers of species. 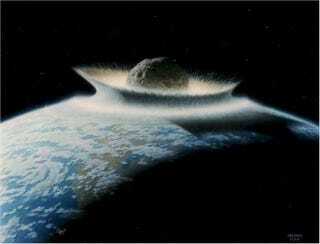 Only recently have geologists found a possible cause: a widespread bombardment of the Earth by meteorites. These would have sterilised an area a few hundred kilometres across – a major ecological disturbance but not a lethal one for a particular species. In fact, what it would have done is free up space. It would have been like putting a quarry in the middle of an area that has no cliffs. Suddenly, you have all the species that live on cliffs moving into the area and increasing the local biodiversity. It would be travelling at 30-40km per second when it hit the top of the atmosphere and would immediately start to vaporise. It would be like turning an oven to broil except it would happen to the entire planet. You would be talking about rendering large areas, possibly a hemisphere, uninhabitable. Within the blast zone, nothing would survive, because when these things hit, they produce plasma and incredible temperatures. It is possible to envisage dealing with an incoming meteorite if we saw it far in advance. We could try to deflect it using spacecraft. Hollywood pictures suggest we could use a big bomb, though this would probably be very silly. We would break the meteorite into parts and would then have several lethal objects, instead of just one, heading our way. However, you could attach little ion engines to the meteorite to divert it over several orbits around the sun. It would only take a very slight deviation. So, no, meteorites don't mean the end of humanity. There's more at the original link, including why dinosaurs weren't just killed off by a big meteorite.